Environmental noise break-in can be a significant issue when naturally ventilating a building located on a noise site, even if the noise is only moderate. Dartington school, previously reviewed within this blog with regard to the creative room acoustic treatment, also required creative forms of noise control measures to prevent noise break-in to noise sensitive teaching spaces. The first stage of any noise break-in assessment is to establish noise levels across the site. 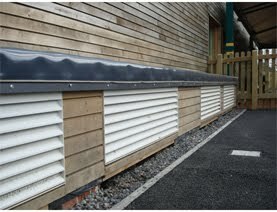 This was done by carrying out noise monitoring throughout the site, over the full operational hours of the school. During the noise survey addition data was collect with respect to traffic flow levels and other data need to build a noise map of the site. 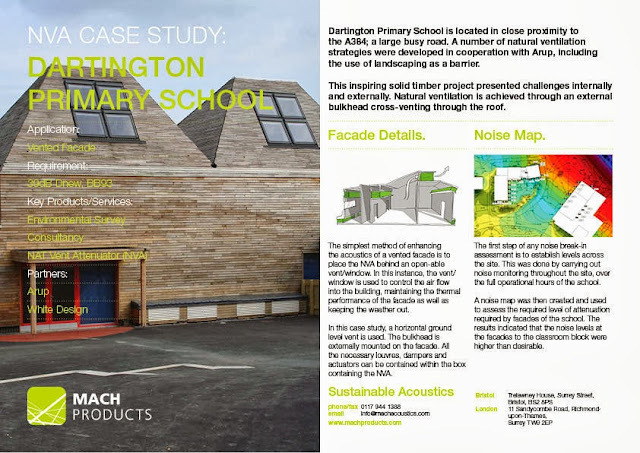 A noise map was used such to assess the effects of the new school and to establish noise levels across all facades. The result of the original noise mapping exercise is shown above in the left hand image. 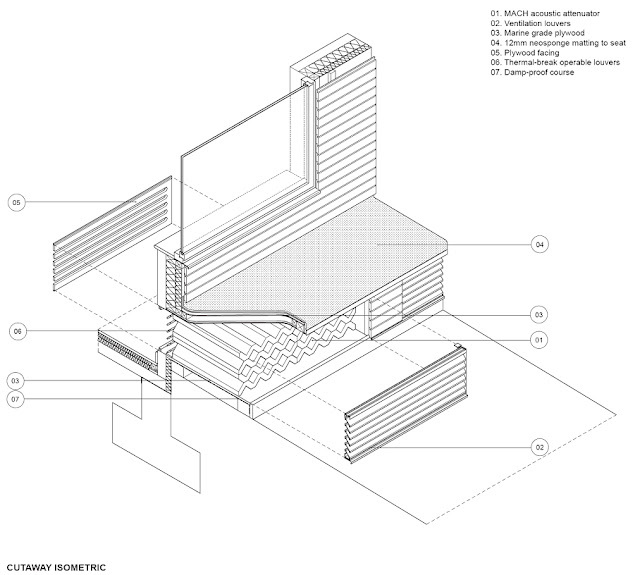 The results of this assessment indicated that noise levels at the facades to the classroom block where higher than desirable. The solution was to use an acoustic screen and strategically placed earth bund to reduce noise levels at the classroom. 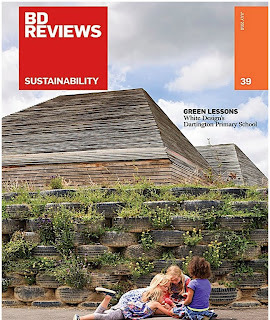 The tire wall is shown on the front cover of “BD Reviews” was used to form the required acoustics screen. This design is highly sustainable since these used tires did not go to land fill. Aesthetically there is a strong recycled image and additionally over time the vegetation shown in the image will cover the wall to form a green, live acoustics screen. A second observation from the above noise mapping exercise was that noise levels at the sports hall were too high to allow for natural ventilation by means of simple openable vents. The solution was to added attenuated vents using the NAT Vent Attenuator. The photo below shows this vent and the diagram provides 3D view through the vent box.